I worked at the Associated Press Detroit bureau in 1974 as a copy boy and a summer intern from Wayne State University -- the boot camp of my journalism career. One of my drill sergeants at AP that year was Jon Wolman, who was only a year older than me but seemed very much my senior. One of my daily duties was to cross the street in early evening to the Detroit Free Press to get carbons of stories that would appear in that newspaper’s first edition. 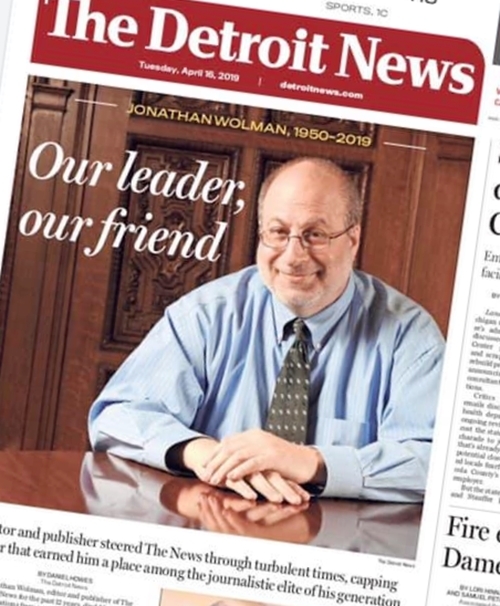 One day I asked Wolman why he didn’t send me down the street to The Detroit News to get copies of their stories. After all, both were AP members. “Because they never have anything good enough to lift,” Wolman told me. Back then, Free Press journalism was ascendant as The News was in decline. Wolman died Monday at age 68 of pancreatic cancer, a newsman making news in death. Just that morning, shortly before the story broke, I’d emailed to ask if he’d be going to the Pistons’ playoff games this week. We tried to get together annually for a baseball game at Comerica Park, and I’d planned to invite him to one this spring. I wasn’t aware of his deadly disease. There are all sorts of Wolman stories making the rounds about his AP career that included stops as the bureau chief in Washington and as a top dog in New York headquarters. A great anecdote concerns the Presidential election of 2000 and pressure felt by Wolman and his AP brass to call either Al Gore or George W. Bush the winner. Turned out, AP wouldn’t say. Too close to call, Wolman said. He stuck to his gut hunch and trusted his staff and got it right. It took several weeks before the Supreme Court gave it to Bush. When I read that, I had a flashback of Wolman in 1974. We are in the Detroit AP bureau, on deadline. He’s got long hair and a dark beard and he might be wearing a denim jacket that hasn’t been washed in a while. Jon was the type of guy who would work the 3 p.m. to 11 p.m. shift by arriving at 1 p.m. and leaving at 1 a.m. He showed you how to be a pro. But although Jon was strict in the AP way, he had a touch of whimsy. We chased stories about an albino toad and a Patty Hearst sighting in Western Michigan. We did the hard stuff, too, like tally the homicides that year as Detroit changed from “Motor City” to “Murder City” and the AP “A” wire wanted lots of it. After that summer, it was decades before I saw Wolman again. At the start of his hitch with The News 12 years ago, I still worked in the East but came home to Detroit in the summer. We’d go to dinner and a ball game and Jon would talk about baseball in Milwaukee because he was from Wisconsin and he ought to know. He was a little kid when the Milwaukee Braves beat the Yankees in the World Series of 1957 and when they lost to them in 1958. Jon could recite that vintage lineup with Hank Aaron, Joe Adcock, Billy Bruton, Warren Spahn, Lew Burdette and Ed Mathews. Jon’s boys of summer. But the Braves moved to Atlanta in 1966, when Jon would have been 15 years old. He told me once that he never went to see the new team, the Brewers, and never returned to County Stadium. After he said this, we went kind of quiet, sort of melancholy. I didn’t press him. I could sense that he had loved a game and team and they had hurt him. And we all know there’s no hurt like teenage hurt and of how baseball can hurt in the best of times.